This waggy would make a great parts rig. 4.0 inline 6 with auto trans. It's almost complete. The only thing missing is the rear window. Does not drive as I think it's lost spark. Turns over but won't fire. Do not have title. I'll take the first reasonable offer. Also open to trades." If it's part owned by a title loan company, some one owes money on it. May be worth looking into. Is the body as good as the pics makes it look? Would be a dang shame to strip that one apart if it’s that clean. This goes out to everybody.....ready? 4x4 Woody, that something I have not seen! 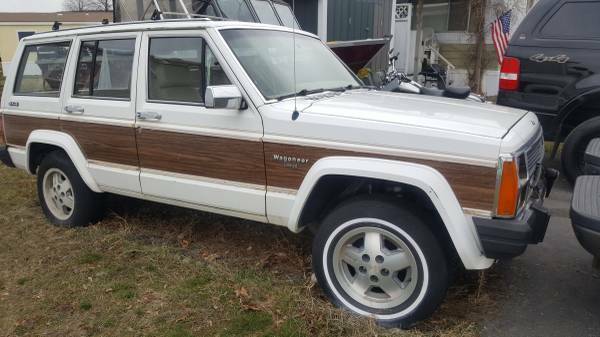 1990 Jeep Cherokee Laredo: 4.0L I6, 4X2, P235 75R 15 Goodyear Wrangler Radials on AR172 Baja Satin Black American Racing Wheels, 214K miles. does anyone have the 4 cylinder and can tell me what temp it runs normally ? Congrats on the Gauge Cluster!! !